Having come up short in 71 majors on the regular tour, it was a memorable day for the 51-year old, who finished on 13-under 261 at Harbor Shores in Michigan. The victory was his first since he took the Travis Perkins Senior Masters last year and fully deserved as he held off a charging Watson, who also closed with a 65. There was a little drama at the end as Montgomerie’s pulled approach to the last ricocheted off the grandstand and onto the green. 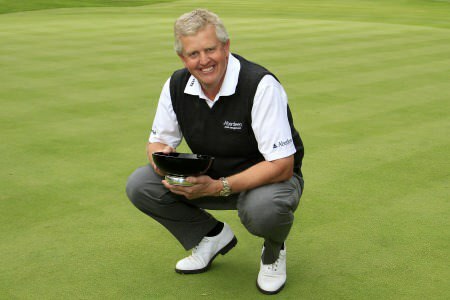 After two putting for victory, Montgomerie said: “It’s been a long time. It’s a very special moment. My caddie has been with me for 22 years and we’ve come close on a number of occasions here and it’s great to finally break that duck. Langer’s 70 saw him finish in a share of third with Jay Haas on seven under. Rafferty had six birdies and six bogeys in a closing 71, dropping shots at his last two holes to finish tied for 64th with Bob Gilder and club professional Craig Stevens on eight over 292.